After his enlistment in his home town of Winnipeg in April of 1942. John Anderson was posted to No.7 I.T.S. where he was selected to pilot training at No.19 E.F.T.S. Successful completion at No. 19 saw him posted to No. 2 S.F.T.S., where he completed the course on April 16th 1943, almost a year from his time of enlistment. Once overseas and completing courses set out for all pilots sent to Britain, he assembled his crew at No. 30 O.T.U, then proceeded on to No. 1656 CU before arriving at 419 squadron on July 7th 1944. All the crew stayed with Anderson through the 30 sorties, except for Wireless Operator WO Johanson. The last operation in which I can find Johanson listed was the night of October 6th. The position of Wireless Operator was filled by a number of different airmen in all of the following operations. It may have been that WO Johanson was injured during the attacks by night fighters on the October 6th sortie. The listing for casualties did not show Johanson which leaves the reason of his departure not fully known. W/C Hagerman's recommendation shows that the John Anderson crew had many brushes with flak and attacks by fighters during their tour. On two separate operations his Lancasters were subject to heavy flak damage and canon fire. A further five operations also mention damage from flak of a lesser degree. On three occasions their Lancaster was attacked by night fighters, sometimes along with the flak hits. But the crew always made it back. On every occasion Anderson's skills brought the crew and aircraft back safely. Wording for the recommendation follows those used in the recommendation for the Victoria Cross, I include them both, with the original VC shown at bottom of article. ANDERSON, F/L John Alan (J25399) - Distinguished Service Order - No.419 Squadron - Award effective 6 February 1945 as per London Gazette of that date and AFRO 508/45 dated 23 March 1945. Home in Winnipeg; enlisted there 22 April 1942. Trained at No.7 ITS (graduated 25 September 1942), No.19 EFTS (graduated 18 December 1942) and No.2 SFTS (graduated 16 April 1943). In postwar period took a North Star course and flew with MATS. Also commanded No.408 Squadron. DSO presented 1 April 1949. Killed in crash of an Argus aircraft, No.404 Squadron, 23 March 1965. Photo PL-13912 shows him receiving wings from his brother, F/O Brodie Anderson; PL-35706 shows him shaking hands with F/L Bud Adams at Repatriation Depot, Lachine; PL-39735 taken at investiture; PL-57769 is a 1953 portrait; PL-62094 shows him at controls of RCAF Comet transport. This officer has displayed a high degree of gallantry and devotion in operations against the enemy. He has completed very many sorties and has set the finest example in pressing home his attacks, often in the face of fierce opposition. On one occasion in September 1944 he was pilot and captain of an aircraft detailed to attack Bottrop. When over the target, intense anti-aircraft fire was encountered. Flight Lieutenant Anderson's aircraft was hit repeatedly by fragments of shrapnel. Both the port engines were put out of action. The hydraulic system was rendered unserviceable. The controls were so damaged that it became necessary for two members of the crew to assist their captain by pulling manually on the rudder controls. In spite of this, Flight Lieutenant Anderson executed a good bombing run. He afterwards flew the severely damaged aircraft to base where he effected a masterly landing. In most difficult and dangerous circumstances this officer displayed outstanding coolness and great courage. Flight Lieutenant Anderson has completed 22 day and night operations against the enemy, during the course of which his outstanding devotion to duty and complete contempt of personal danger have been most remarkable. His determination to press home his attacks in spite of the fiercest opposition the enemy can put up has earned him the utmost admiration from all ranks. On no fewer than ten attacks his aircraft has been badly damaged by enemy action but his enthusiasm to operate remains undiminished. On July 28th, 1944, when detailed to attack Hamburg, his starboard inner engine failed when crossing Flamborough Head en route to the target. 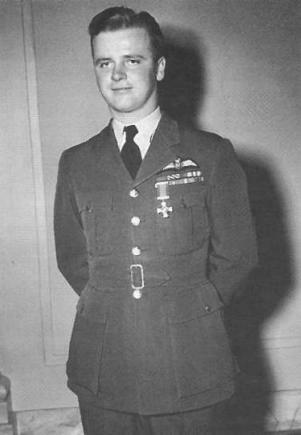 Although Flight Lieutenant Anderson was aware that he would probably lose height and be late on the target, he nevertheless, without hesitation, carried on, arriving on the target six minutes late and bombing from 8,000 feet below the main stream. On the return journey, when thirty miles off Heligoland, his aircraft was attacked by two FW.190s, one dropping fighter flares while the other made no fewer than five attacks. These were all successfully evaded and the attacking aircraft was so badly damaged by his gunners that it broke off the attack and was last seen in flames going down in a steep turn. This officer then brought his aircraft safely back to base, still on three engines. On 25th August 1944, when detailed to attack Russelheim, his aircraft was badly damaged by flak on the way into the target. Many holes were made in the fuselage; nevertheless he pressed home his attack and, on his return, was diverted to Great Orton after ten hours 50 minutes flying. Again, on 27th August 1944, when attacking Mimoyecques, his aircraft was again hit by heavy flak over the target area, no fewer than 37 large flak holes being counted on his return to base. On 29th August, when attacking Stettin, his GEE and H2S equipment became unserviceable while crossing the English coast on the way out, but he proceeded on D/R navigation to the target, where he again suffered heavy damage from flak. While in the target area, his aircraft was coned for some considerable time while on the bombing run and was attacked by a Ju.88. Nevertheless he brought his aircraft safely back to base. On 6th September 1944, when attacking Emden, his aircraft was hit by heavy flak while on the approach, but this did not prevent him from making an excellent bombing run and returning with a first-class picture of the aiming point. On 12th September, when attacking Dortmund, his aircraft was hit by concentrated heavy flak, many large holes being torn in the fuselage, but again he returned safely to base. On the 6th October, while attacking Dortmund, his aircraft was again hit by flak while on the bombing run and, after bombing, he was attacked by no fewer than five fighters, all of which were successfully evaded. On the 8th October, when attacking Bochum, 27 large flak holes were torn in his aircraft and, during an attack by two fighters, a cannon shell exploded in the fuselage, short-circuiting the entire electrical system and causing all the navigation lights to burn. With great skill and coolness, he successfully evaded the fighters which were attracted by his lights and successfully returned to base with his aircraft in a badly damaged condition. On the 14th October, when attacking Duisburg in daylight, his aircraft was again hit by predicted flak and a "scarecrow" but again he succeeded in returning to base with a badly damaged aircraft. This officer's most outstanding feat was performed during a daylight attack on the oil refinery at Bottrop on the 27th September. On arriving at the target it was found that this was obscured by 9/10th cloud cover. The target was sighted through a gap in the clouds too late to afford an accurate bombing run. Anti-aircraft fire was very heavy, but without hesitation, Flight Lieutenant Anderson decided to do an orbit to ensure an accurate bombing run be made. At the beginning of the orbit, the aircraft was repeatedly hit by shell fragments and both port outer and inner engines were put out of action. The port outer engine was also set on fire, the hydraulic system was rendered unserviceable and the controls were damaged to such an extent that he had to call on the assistance of two members of his crew to pull manually on the rudder controls. With complete disregard of the heavy opposition, and the difficulty in controlling his crippled aircraft, Flight Lieutenant Anderson completed the orbit and made a steady bombing run, enabling his Air Bomber to attack the target very accurately. Shortly after leaving the target, it was found that the starboard inner engine had also been badly damaged and was giving less than half power. Through superb planning, crew co-operation and flying skill, Flight Lieutenant Anderson successfully flew his crippled aircraft back to this country, with only full power from the starboard outer, half power on the starboard inner engine, and made a masterly landing without causing further damage to his aircraft or crew. ANDERSON, F/L John Alan, DSO (J25399) - Distinguished Flying Cross - No.419 Squadron - Award effective 5 February 1945 as per London Gazette dated 16 February 1945 and AFRO 625/45 dated 13 April 1945. Award presented November 1946. Flight Lieutenant Anderson has completed many successful sorties against the enemy throughout his tour. He has displayed conspicuous gallantry and devotion to duty. On one occasion in July 1944, when en route to Hamburg, one engine of the aircraft failed. Although fully aware that height would be lost and the target reached late, without hesitation Flight Lieutenant Anderson pressed on and completed a successful attack. On the return journey the bomber was attacked by two Focke Wulf 190s. The attackers were eventually beaten off, one being so severely damaged that it was seen to dive towards the ground completely out of control. Flight Lieutenant Anderson then flew his crippled aircraft safely back to base. Another time in August 1944, while bombing Stettin, his bomber was illuminated by searchlights and at the same time was attacked by a Junkers 88. In the face of this fierce opposition he successfully completed the mission. Again in October 1944, undeterred by attack from five enemy fighters, he accomplished a most skilful attack and eventually evaded all of the hostile aircraft. On several other occasions during September and October 1944, Flight Lieutenant Anderson has flown his aircraft, although badly holed, safe back to base after pressing home some most successful attacks. His cool courage and outstanding leadership have at all times been exemplary. He well deserved the Honours he received during his service with 419 during the war years. He stayed with the RCAF after the war flying North Stars for MAT and Argus aircraft during these post war years. He also commanded Number 408 squadron. On March 23 1965 he was killed while on an Argus aircraft of 404 squadron. The recommendation for Victoria Cross for F/L Anderson was changed to the DSO, after consideration of those on the committee who make decisions on who will be a recipient. The presentation of his DSO medal was not made until April of 1949, almost five years after the recommendation. To understand their reasons for the change we need to look at the history and the process behind the Victoria Cross. It was highly unlikely that the recommendation for the Victoria Cross was held back because the events and damages described in the recommendation were not found in reports such as the Raid Summary or that any Combat Reports were completed for different encounters listed in the VC recommendation. Noted in a communications between RCAF HQ and the squadron, line iii for October 9th (1944) mentions that the damage done to Anderson's Lancaster VR-P was not mentioned in the Raid Summary. So the accompanying documentation seems to have not been completed and HQ was requesting them. 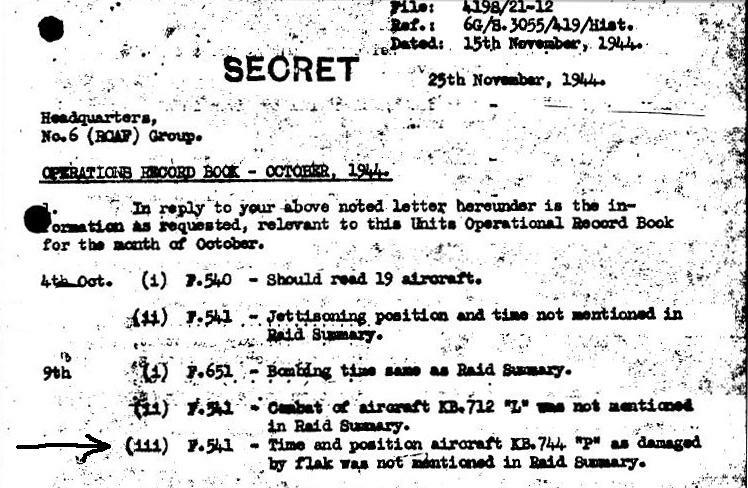 In a reply to RCAF HQ on a similar communication regarding missing Combat Reports, dated June 1944, the reply to HQ was " The Diary Officer states that the information is supplied by Intelligence which apparently does not always elicit information concerning combats. The unners on return seem to consider that merely seeing an enemy aircraft and firing a few rounds at it is not an event unless hits are recorded, and that the combat reports are, in any event, sufficient information." And so from this it can be seen that not all encounters with enemy aircraft are recorded. It is up to the gunners and /or Intelligence if a report is needed. Within the volumes of data on the squadron are pages and pages of requests from RCAF HQ for corrections to the squadron records and asking for missing reports from the squadrons administration staff at Middleton St. George. Although these items were absent at the time or lost to us now, the true reasons behind the awarding of the DSO instead of the VC can maybe best be found in the research done by Hugh Halliday and presented in a paper he researched and presented. The Victoria Cross was only awarded sixteen times to Canadians during the Second World War. Of those three were airmen. F/L David Hornell, S/L Ian Bazalgette (RAF) and P/O Andrew Mynarski. At least seven other RCAF airmen (maybe others) of these one received no award at all the others found were awarded Mention in Dispatches. The Victoria Cross up until 1914 was the only award for gallantry. Other awards were later created and the standard of the V.C. was raised in reference to the past history of VC investitures. The differences even between the two World Wars was greater, many of those V.C.s awarded during the First World War would not have been presented for the same circumstances in WWII. The idea being that the VC was an honour of the highest merit. Thanks to the work of Hugh Halliday in his paper, "VC or not VC Bestowing a Battlefield Icon" some of the documentation he has compiled and presented in that paper, reveal some points. As he mentions "remarkable points" of how the they determine who to invest with a Victoria Cross. After the recommendation for a V.C. is presented to the committee it is subject to the "rules of the game" and the end decision is totally British hands. This also includes the King. As pointed out in Mr. Halliday's writings there was a dilemma for officials making the decisions, an award to someone who had died left them with only three options to choose from, Victoria Cross, George Cross or Mention in the Dispatches to be awarded. In fact a choice between the top two honors and the lowest honour. Whereas if the recipient survived they were eligible for a much wider range of honors . What Mr. Halliday mentions is that the Air Ministry communicated to the senior officers that the Victoria Cross was " for getting into trouble" and " not for getting out of trouble". ( I Do not follow what that means) Also communicated to the Senior Officers was that acts of self-preservation would not count, desperate acts to save others would count. The act of saving others placed another possible problem for the board. Many pilots stayed at the controls while their crew had a chance to bail out. In effect "desperate acts to save others". Bomber Command went on to say that these acts of "Uncommon Valor" were common and went on further to state that the pilots had a duty to remain at the controls for as long as possible. The board had placed before them more then once similar Victoria Cross recommendations as the one for F/L Anderson. Ones in which a series of valiant and brave actions were carried out during operations against the enemy. They had been coined "long haul" awards. Others of these had been turned down for a VC. In fact one prospective recipient had completed over 100 sorties and was turned down. When we come back to the recommendation by W/C Hagerman of a Victoria Cross for F/L Anderson the one reason that stands out is that although they were a series of acts of bravery. They could be part of what the committee described as a "long haul" award. And as mentioned men who had completed four tours had been turned down for the V.C., while Anderson had completed just 22 sorties when it was put into writing. The committee did balance each recipients record with others to help in their decision. This officer has displayed a high degree of gallantry and devotion in operations against the enemy. He has completed very many sorties and has set the finest example in pressing home his attacks, often in the face of fierce opposition. On one occasion in September 1944 he was pilot and captain of an aircraft detailed to attack Bottrop. When over the target, intense anti-aircraft fire was encountered. Flight Lieutenant Anderson's aircraft was hit repeatedly by fragments of shrapnel. Both the port engines were put out of action. The hydraulic system was rendered unserviceable. The controls were so damaged that it became necessary for two members of the crew to assist their captain by pulling manually on the rudder controls. In spite of this, Flight Lieutenant Anderson executed a good bombing run. He afterwards flew the severely damaged aircraft to base where he effected a masterly landing. In most difficult and dangerous circumstances this officer displayed outstanding coolness and great courage. Flight Lieutenant Anderson has completed 22 day and night operations against the enemy, during the course of which his outstanding devotion to duty and complete contempt of personal danger have been most remarkable. His determination to press home his attacks in spite of the fiercest opposition the enemy can put up has earned him the utmost admiration from all ranks. On no fewer than ten attacks his aircraft has been badly damaged by enemy action but his enthusiasm to operate remains undiminished. On July 28th, 1944, when detailed to attack Hamburg, his starboard inner engine failed when crossing Flamborough Head en route to the target. Although Flight Lieutenant Anderson was aware that he would probably lose height and be late on the target, he nevertheless, without hesitation, carried on, arriving on the target six minutes late and bombing from 8,000 feet below the main stream. On the return journey, when thirty miles off Heligoland, his aircraft was attacked by two FW.190s, one dropping fighter flares while the other made no fewer than five attacks. These were all successfully evaded and the attacking aircraft was so badly damaged by his gunners that it broke off the attack and was last seen in flames going down in a steep turn. This officer then brought his aircraft safely back to base, still on three engines. On 25th August 1944, when detailed to attack Russelheim, his aircraft was badly damaged by flak on the way into the target. Many holes were made in the fuselage; nevertheless he pressed home his attack and, on his return, was diverted to Great Orton after ten hours 50 minutes flying. Again, on 27th August 1944, when attacking Mimoyecques, his aircraft was again hit by heavy flak over the target area, no fewer than 37 large flak holes being counted on his return to base. On 6th September 1944, when attacking Emden, his aircraft was hit by heavy flak while on the approach, but this did not prevent him from making an excellent bombing run and returning with a first-class picture of the aiming point. On 12th September, when attacking Dortmund, his aircraft was hit by concentrated heavy flak, many large holes being torn in the fuselage, but again he returned safely to base. On the 6th October, while attacking Dortmund, his aircraft was again hit by flak while on the bombing run and, after bombing, he was attacked by no fewer than five fighters, all of which were successfully evaded. On the 8th October, when attacking Bochum, 27 large flak holes were torn in his aircraft and, during an attack by two fighters, a cannon shell exploded in the fuselage, short-circuiting the entire electrical system and causing all the navigation lights to burn. With great skill and coolness, he successfully evaded the fighters which were attracted by his lights and successfully returned to base with his aircraft in a badly damaged condition. This officer's most outstanding feat was performed during a daylight attack on the oil refinery at Bottrop on the 27th September. On arriving at the target it was found that this was obscured by 9/10th cloud cover. The target was sighted through a gap in the clouds too late to afford an accurate bombing run. Anti-aircraft fire was very heavy, but without hesitation, Flight Lieutenant Anderson decided to do an orbit to ensure an accurate bombing run be made. At the beginning of the orbit, the aircraft was repeatedly hit by shell fragments and both port outer and inner engines were put out of action. The port outer engine was also set on fire, the hydraulic system was rendered unserviceable and the controls were damaged to such an extent that he had to call on the assistance of two members of his crew to pull manually on the rudder controls. With complete disregard of the heavy opposition, and the difficulty in controlling his crippled aircraft, Flight Lieutenant Anderson completed the orbit and made a steady bombing run, enabling his Air Bomber to attack the target very accurately. Shortly after leaving the target, it was found that the starboard inner engine had also been badly damaged and was giving less than half power. Through superb planning, crew co-operation and flying skill, Flight Lieutenant Anderson successfully flew his crippled aircraft back to this country, with only full power from the starboard outer, half power on the starboard inner engine, and made a masterly landing without causing further damage to his aircraft or crew.